A preserved bouquet of flowers is a thing of beauty forever, and you will want to display it in a fitting container. What sort of container would be most appropriate is up to you, of course, but there are many instances when the best option would be a shadow box. A shadow box is a type of shallow box with a glass display front that lets you show off your things like a store would in a window display. Here are three times when shadow boxes may be your best display option. forever keeping your memories pristine and where you can enjoy them. Memorializing a particularly meaningful anniversary can be difficult. Each anniversary is one-of-a­-kind, and the bouquet that you get at the anniversary celebration should be preserved in a way that captures that unique combination of events and feelings that made it up. 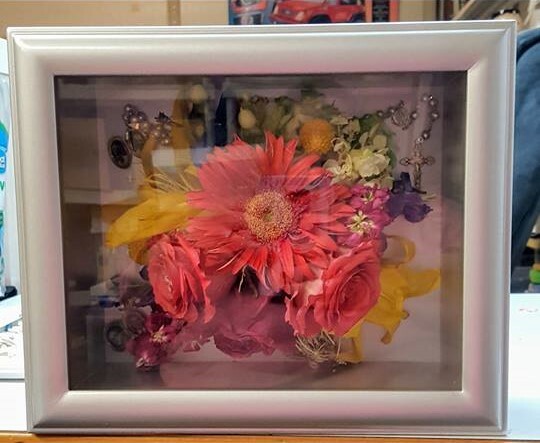 You are in luck, because preserved flowers in shadow boxes are perfect for this. Shadow boxes can come in a range of backgrounds and frame styles. You can pick the background color that compliments the flowers and the frames that best describe that anniversary. Was it a silver wedding anniversary where you received a gorgeous bundle of red roses from your significant other? A brushed silver frame with a snow white background could evoke that day for you. Or perhaps you would like something ornate to express your sense of style. It was your anniversary, make the shadow box communicate your anniversary perfectly. Perhaps you want to preserve the flowers you received when your child was born. A shadow box can hold not only those beautiful blooms, but the little things that express your love and eternal attachment to that child. Or maybe you want to commemorate your whole family and have no interest in scrapbooking. A shadow box full of your wedding boutonniere and pictures from vital moments from your family history can more fully convey what you really feel for your loved ones. Plus, it will look great on your mantle, so there will always be a reminder of the family bonds on display, comforting family members forever. These are just three examples of times your preserved flowers would be best displayed in a shadow box. There are many more events and celebrations that would prove fitting for a preserved flower shadow box display. If you want help with both preserving the flowers and creating the display, contact us. We can make your memories live forever.